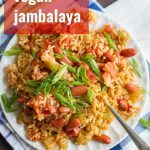 This easy vegan jambalaya is made with a spicy mixture of brown rice, red beans and bell peppers. It cooks up quick and easy on the stove, or you can let it simmer away in the slow cooker! When I was in law school, I had a friend from New Orleans who would go out every year and buy a traditional Mardi Gras cake that had a little plastic baby baked right into it. He would invite a few friends over to his apartment on Fat Tuesday for a low-key lunchtime celebration. I forget the details of the tradition, but whoever got the slice of cake containing the baby was somehow special or blessed. I never got the baby, but was always happy for the chance to enjoy some celebratory cake. So, of course my first thought for posting a Mardi Gras recipe was to recreate that cake, but the thought of baking plastic toys into my food freaks me out a bit. I was also hoping to avoid the “fat” part of Fat Tuesday, especially since I didn’t have any Mardi Gras celebration plans myself, and I usually reserve my dessert posts for those occasions when I have some dinner company to feed the results to. Maybe in some future year I’ll plan a celebration so I can share some home-baked fatness with you all. Last week’s sausage recipe would be the inspiration for jambalaya as my Mardi Gras post. Once I had the idea for the sausage, the jambalaya seemed like the obvious next step. I have to admit here that traditional jambalaya is something I’ve never had, though it apparently involves shrimp and sausage. I’d already covered sausage by the time I came up with the idea, and upon some further consideration, red beans seemed like a great substitute for shrimp. You don’t have to make your own sausage for this. The homemade variety is nice, but if you’re not up for that much work you can use your favorite commercial vegan sausage. Personally, I’m a big fan of Field Roast. The slow cooker aspect of this recipe makes it nice for a couple of reasons. First, and this is something I often forget due to not busting out the slow cooker often enough, the all day simmering of Cajun spices will give you a whole day of comforting, appetizing aromas in your home. 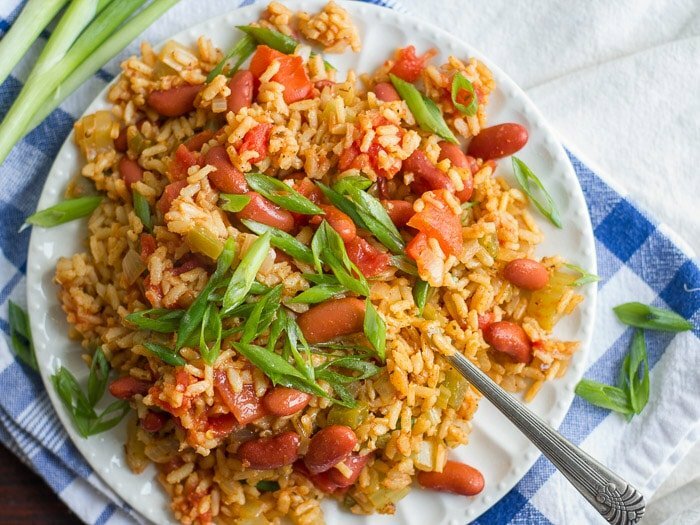 Second, the slow cooker is great if you’re serving this as party food — be it Mardi Gras party food or something else. The initial four hour cook time is approximate, so you can let it simmer away as you party and just throw the rice in about an hour and a half before dining time. 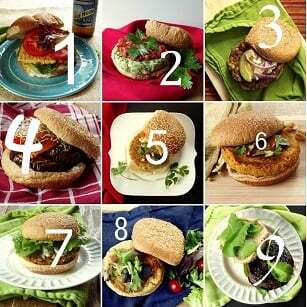 This post originally published on Connoisseurus Veg on March 3, 2014. Updated on December 23, 2016 to include stove top cooking method. Place oil, pepper, celery, onion, garlic, tomatoes, 4 cups of broth, paprika, cumin, black pepper, thyme, oregano and hot sauce into slow cooker set to low heat. Cover and cook for 4-5 hours, stirring occasionally. Add the rice and raise the heat to high. Stir, cover and cook for another hour to an hour and a half, stirring occasionally, until rice is tender and all liquid is absorbed. Add more broth if the rice becomes too dry during cooking. Add beans and sausage. Stir and cook another 2 minutes or so, until beans and sausage are heated throughout. Coat the bottom of a large pot with oil and place over medium heat. When the oil is hot add bell pepper, celery, onion, and garlic. Sauté for 5 minutes, until veggies are softened. Add tomatoes, 4 cups of broth, paprika, cumin, black pepper, thyme, oregano, hot sauce, and rice. Raise heat to high and bring to a boil. Lower heat, cover, and allow to simmer until the rice is cooked and liquid is absorbed, about 45 minutes. Remove from heat and allow to sit for about 5 minutes, covered. If using vegan sausage, briefly heat it on the stove or in the microwave while the rice sits. Remove lid, fluff rice with a fork, and stir in the beans and sausage. Serve topped with scallions. Nutrition information does not include vegan sausage, since there's so much variation among brands. I made this for dinner tonight. It’s delicious! I made the recipe exactly as instructed, except that I used one cup less of vegetable stock since I used a can of tomatoes and just included the liquid with the diced tomatoes. Very little work for so much food. Thanks for the recipe! Glad to hear it was a hit! Thanks Kayla!! You poke the plastic baby into the bottom of the king cake after it’s baked :) no plastic in oven necessary. This recipe looks super yummy though. This was amazing! Also a perfect solution to meal time, we have vegetarians and meat eaters. I cooked veggie, chicken, and beef sausage, set it out family style, everyone was happy! Thank you! Awesome! I’m happy to hear that everyone enjoyed it! Thanks Bev! Thank you so much for posting. It is delicious! I added a little more spice because I like a real kick. Your recipe was easy to follow and easy to make. I am a real slow cooker fan and enjoy how easy it can be to prepare a delicious and nutritious meal. Vegan of course! I’m glad you enjoyed it! I tend to throw some extra hot sauce on mine – I’m a big fan of spicy food too! I’m sorry to hear that! Did you use the stove top or slow cooker method? My husband and I just finished this wonderful dinner! It was very easy to make in the crock pot, very flavorful and of course it was totally Vegan! 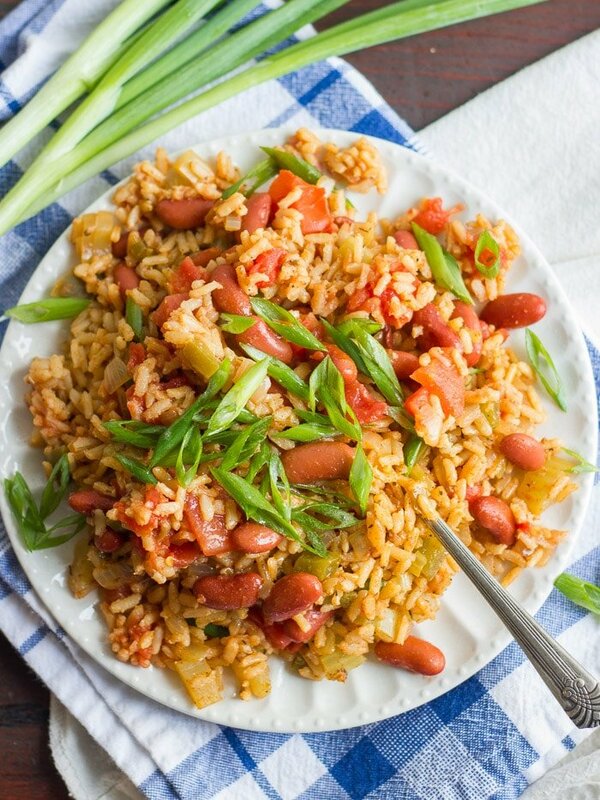 It was delicious as is but opened my eyes to the potential of switching up some ingredients and maintaining the essence of Jambalaya! The man says he’d eat this once a week so I call that a winner! Yay! I’m happy to hear it was a hit. Thanks Laura!! I’m always skeptical about slow cooking rice because it usually ends up mushy. So thank you so much for adding a stove top method. Looks absolutely delicious! Thanks! I hope you enjoy it!! So I just made this… added a little nutritional yeast and chili powder. Even my non vegan friends are eating seconds!! Thanks for the recipe. I’m so glad it’s a hit! Thanks Brittany!! Is it ok to cook it on high heat for a shorter amount of time? Do you mean for the slow cooker version? I think so, but I’m not sure of the time so you’d need to keep an eye on it. Hi! I’m looking forward to making this for Thanksgiving. I read where one reviewer said she added nutritional yeast which sounds great to me! Which stage of the preparation should it be added? 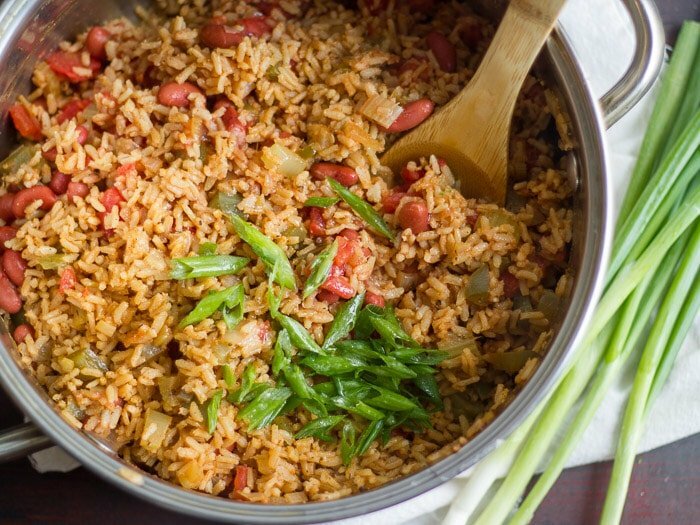 I am ready to make this but would need to start it around 7am and wouldn’t get back to it until around 3pm to add rice – would that be ok or should I save this for the weekend? Thanks! I’d be nervous that too much of the liquid would cook off. You’re probably best to wait until the weekend! Awesome dish!!! It’s definitely going to make it in my “cookbook” for future ideas to make for dinner. When you want something hardy and warmth, this is the dish. I’m so glad to hear that!! Thank you so much! I accidentally used vegan creamy vegetable broth with soy milk as the main ingredient in the slow cooker with this recipe. Is this going to ruin our dish? I haven’t tried the recipe with a creamy broth, so I’m afraid I’m not sure! 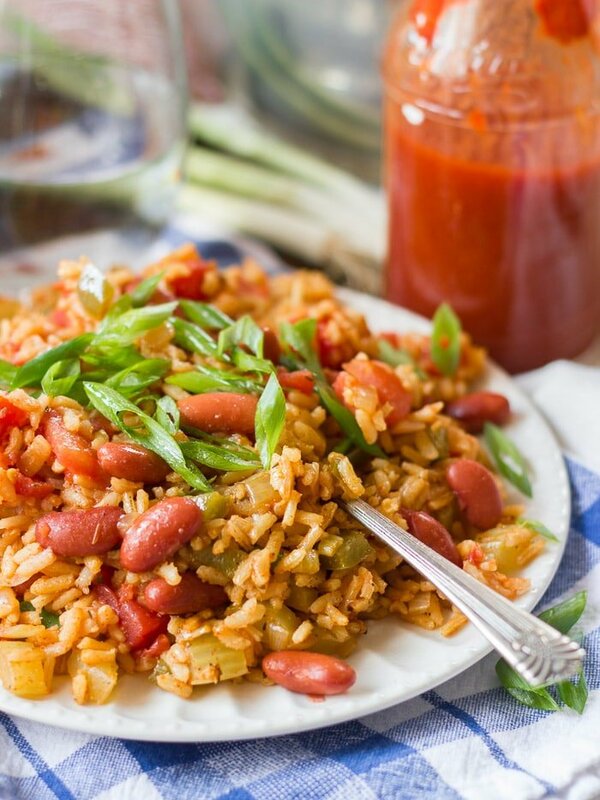 I’m chowing down on this incredibly delicious jambalaya as I type to you to let you know……WOW! you’re a genius! Best jambalaya I’ve ever eaten and I made it! lol …thanks to you. I didn’t have 2 cups of long grain rice and ended using up all the bits and scraps of different types of rice I had lying around to equal 2 cups and it still works. I also substituted mushrooms for celery only bc I didn’t have any. Awesome, thanks for sharing, looking forward to trying your other recipes. Yay!! I’m so glad you’re enjoying it! Thanks so much Jaclyn! Which flavor vegan sausage did you use? I’m going to make this next Sunday to eat during football. But I have a question; how much did you measure out for each serving? One cup per serving? About two cups per serving. I hope you enjoy it! Do you think I can add dried kidney beans instead? I feel like they will cook after 6 hours in a slow cooker..
I’m afriad I’m not sure! I’d definitely soak them first if you try, and please let me know how it works out if you do! Just finished this recipe and it turned out wonderful! I work a night shift so anything I can prep before bed and wake up to is awesome. My daughter was also home sick from school so occasional breaks from naps to stir or add ingredients wasn’t a problem. Multitasking is always key. I did put in two cans of veggie broth which might of been too much since my rice turned out a little mushy.. or I overslept lol..however it smells and taste great and made a great portion for our weekly dinner meal prep! Thanks for the recipe! I’m so glad you enjoyed it! Thanks Tia! Coming soon! Nutritional information is the current project. It just takes a while to get to all the recipes! Here is something that I find helpful. Enjoy! Does this heat up well if preparing for someone else to eat the next day? Any suggestions or modifications? About 6. Thank you and enjoy! I’m afriad I don’t have an instant pot, so I can’t be much help! If you’re able to do it successfully I’d love to hear how it works out! Would it work with black rice instead of brown? Hmmm…I’m afriad I’m not sure! Black rice has a different texture and cooks a bit differently, so I can’t say without trying it. Please let me know how it works out if you do! Can this last for multiple days? Very yummy. I did the stove top version. Husband enjoyed very much. When do you add the beans and sausage? The flavor was really good. However, as the last person that commented stated, it was a bit spicy! I cooked it in my slow cooker, but I think next time I’ll ease up on the spice and precook the rice. The rice didn’t get tender like it should be. I even added an extra hour to the time on high. Also, I used the Field Roast Chipotle Sausage which was really good for this dish. I would say it’s relatively mild, but I have a taste for spicy food. :) If you’re nervous about the heat level you can always add a bit of hot sauce at a time when it’s all done cooking. Going to try this for a family meal tomorrow, grandson veggie. What size of cup when measuring? You’ll want to use an 8 ounce measuring cup. You can try this calculator if you normally use different units: https://goodcalculators.com/cooking-conversion-calculator/ I hope you enjoy the recipe! I almost always change recipes, but this one is perfect as written. I used all the ingredients and quantities as listed. Perfectly seasoned and spiced. Really enjoyed it! Will definitely make this again! Awesome!! I’m so glad you enjoyed it! Thanks Laurel! Hello, this recipe look delicious! Do you think it would freeze well?? Thanks! Just made this today-only substituted hot sauce with a bit of sriracha, and I cooked it in my instant pot instead. I used fresh tomatoes and one whole green bell pepper and one whole red bell pepper. I’m addicted!!!! I’m so glad you enjoyed it, and great to hear that it works in the instant pot!! Eating this as I type and quite pleased with the result. The one thing I would perhaps do differently is reduce the cooking time of the veggies in the slow cooker to allow them to be crunchier as the 4-5 hour initial cooking time does leave the peppers and celery rather soft. Could probably be cooked for an hour or two and then add the rice for another hour to leave the veggies crunchier, but that’s just a personal preference. Otherwise, this tastes fantastic and I’ll likely be making it again. Thanks for the recipe! I’ve just made this. I look forward to my boyfriend coming home so that we can sit down to this meal. I’m eager to try it! I tasted a little and it was good. I used Trader Joe’s soy chorizo sausage and that seems to have worked really nicely with this recipe. I bet Trader Joe’s soyorizo was delicious in here! I hope you enjoyed the meal! I have this cooking on the stove now. It’s been cooking for wayyy longer than 45 minutes. More like an hour & 15 minutes, and the rice is still hard. Had to add more broth, and it started sticking to the pot. I had high hopes for this recipe, but not too sure right now. It also tastes rather bland – had to add lots of salt and Creole seasoning to kick it up. Hmmm…that’s very odd! I’ve never had any variety of rice take more than 50 minutes to cook. Did you cover the pot? Not doing that will generally result in undercooked rice. The only other thing I can think of is to lower the heat – if it’s too high you’ll end up with too much steam escaping and not enough water for the rice to cook. Can I cook the rice separate in a rice cooker and add it at the end? I think so, but just make sure you use the broth to cook the rice instead of putting it in the slow cooker or in the pot with everything else. You’ll also probably need to reduce the amount a bit. Hi, how big of a crock pot is needed for this? This was excellent. I know Paprika and Hot Sauce can be overpowering so I only used half of what the recipe called for. When I make this again (and again) I will try it exactly as the recipe states. I would not have minded more heat. I did it on the stovetop but could have used a few more minutes on the rice. I used canned tomatoes and included the liquid. It turned out perfect. I still could have used a little bit more liquid and cooked the rice a few more minutes. I saw one of your readers used mushrooms instead of celery but next one I think I will use mushrooms instead of sausage. Thank you for the great recipe! I’m so glad you liked it! Thanks Lori! I’m sorry to hear that! Did you make sure it was on high heat and covered? oil before putting into the crockpot? No need to sauté the veggies, but you certainly can if you want to! And 4 quarts should be just big enough for this recipe. Enjoy! My family loved this! I used the Italian sausage Field Roast that I had and it was delicious! We have been plant based for 1 year now, and it has been hard to find recipes that both my kids like. Thank you! I’m so glad it was a hit! Thanks Leigh!